Mr. Hulot’s Holiday belongs to a rare class of films. It’s one of those titles that evokes such a warm, vibrant mood that there’s something intangibly magical imbued into its runtime. It’s a film about a holiday that shares the relaxed, idyllic pace with the audience without ever feeling droll or overstimulating. Even moments when the film seems like it should be distressing, there’s too much warmth imbued in the film to feel anxiety or stress. Each moment where the film should lul into boredom, is brought back from the brink by an interesting gag. The best image of the films mood is introduced in the opening moments of a film: a dog napping in the middle of the road. The driver of a bus of vacationers honks the horn at the dog. The dog looks up before deciding to slowly rise and saunter out of the way. Moments later, he’s returned to his warm patch of asphalt. The titular Mr. Hulot (Jacques Tati) drives up to the same dog and his pitiful bike horn fails to motivate the dog to move. The dog remains completely unconcerned or distressed by the world around him. 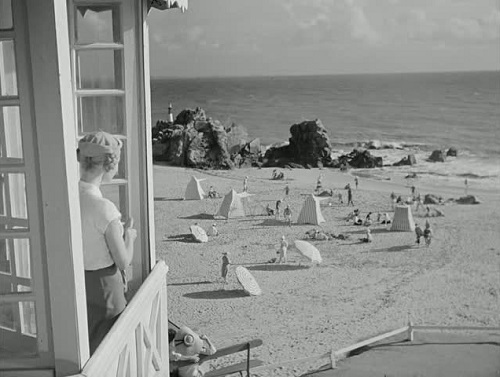 Mr. Hulot’s Holiday evokes a similar feeling of complete and utter relaxation. The most potent element in producing this effect is the use of music. Alain Romans’s “Quel temps fait-il à Paris” is a slow, brassy number repeated throughout the film. This repetition often evokes a deep sense of familiarity as the film develops further. This continual aural hook makes many a scene feel as if it is outside the worries of time, simply a continual, soothing repetition. The titular character is also integral to the core feeling of the film. 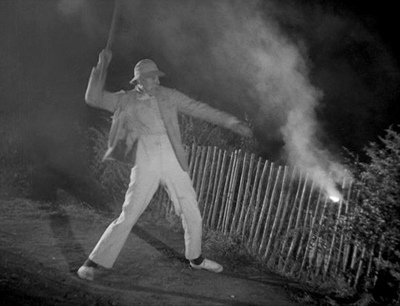 Monsieur Hulot is the epitome of a gentleman, polite and considerate, perhaps to a fault. However, he is often ill-equipped to take on the unforseen circumstances that fall his way. He’s genuinely likable, but also almost childishly buffoonish and often oblivious to his environment. This leads to either overestimating his own abilities in approaching a problem, or mistaking something innocuous as a problem he should attempt to solve. However, this trait of buffoonery is never played loud and large. He’s not seen as an idiot and most of his attempts to make things better are done with an air of politeness. The best example being when he attempts to put out fireworks, but seems to hold them so daintily that he fails to actually put any of them out and only proceeds to spread the sparks further around by being unable to toughly handle the situation. It’s a buffoonery of decorum. Most of the gags involve misunderstandings. For instance, when Hulot’s car breaks down in front of a funeral, Hulot pulls out an innertube for his car, which falls onto the damp ground. When he picks it up, dead leaves are now sticking to the tube. 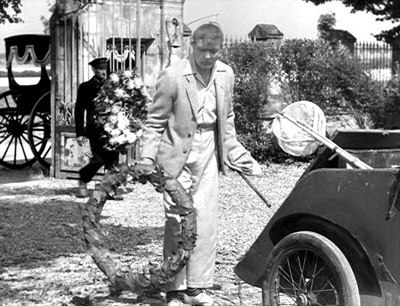 As it happens, the driver of the hearst is walking by with a wreath and assumes the inner-tube is another wreath and takes it from Hulot who is, of course, too polite to correct the driver’s mistake. This funeral scene, while humorous, is an example of how the film keeps itself from being too sentimental. There is a great warmth to be found in the film, but it is not without troubles and tensions. 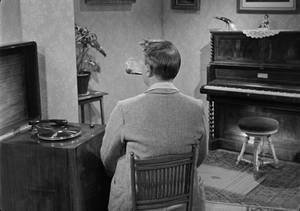 Hulot often finds himself at odds with the other guests and the proprietor of the hotel for being messy or unintentionally annoying. By the end, he’s ostracized himself from most of the tourists after being a troublesome and disruptive presence. Mr. Hulot’s Holiday is a delightfully warm and funny vacation film. It’s ability to evoke a feeling of relaxation and ease while also building comedy out of certain tensions elegantly balances humor and ease. It does this while always being sympathetic and inviting towards its characters. There’s no spitefulness at work, only natural and understandable misunderstandings that remind the audience that human interaction is just as defined by miscommunication as it is communication.